Nancy Arbuthnot brings a world of talents to LEAP (Life Skills, Education and Arts Program) and is always seeking new ways to incorporate them into a class that is fun, expressive and tied to LEAP’s overall mission. 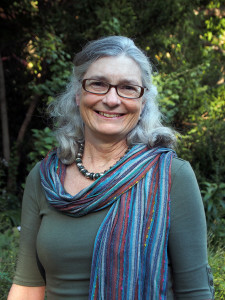 In the past two years Nancy has taught poetry, creative writing, personal journaling, collage and watercolor painting. In one of our favorite classes, a group of women created artwork depicting Calvary’s Core Values, and were so proud of their work that we had a group presentation at the end of the eight-week session. Women who were normally very shy were eager to stand up and present, and one woman even wrote a poem for the occasion (see below). Nancy is always prepared with both lessons and materials. She brings humor to bad days and respect to every student. She has also never missed a class! I have lived in D.C. since the 60s. I have ridden on an elephant! How are you involved at Calvary? I have led a variety of LEAP workshops, including creative writing and watercolor painting. I have also held special holiday card-making sessions. And I have helped on occasional Saturdays when my church is scheduled to provide dinner. I heard about Calvary through my church. I love how much I get out of volunteering at Calvary, working with the staff and the residents both. I like how honest the residents are (“We have too much poetry,” one told me once) but also appreciative (“Thank you for helping me notice leaves on the sidewalk!” one woman said after an art class). Two experiences I’ll never forget — one, at our time of sharing during a Valentine’s workshop years ago, one woman sang a beautiful, haunting “Amazing Grace”; more recently, after choosing a seat next to me for each class after the first, a resident told me that “I had the power” because good things seemed to happen to her during and after the class. No one has ever told me that before, and it makes me feel… powerful! Definitely get involved! You can find something to share with the women that they will value — and you will take away much more than you give! Below is the poem composed by a former resident at Calvary, incorporating all of Calvary’s Core Values. love equals grit, respect and honesty. that lies ahead and opens up to the sky. that it’s diversity that unlocks every door. Just say hello, and you will see! LEAP Facilitators such as Nancy are committed and enthusiastic instructors who lead educational and enrichment classes on a wide variety of topics for Calvary residents on weekday afternoons. We welcome volunteers who can commit to lead ongoing classes for up to 10 participants that offer tangible skills and promote well-being. This is a great opportunity for skilled volunteers to share their knowledge—and a great chance to develop a meaningful relationship with our residents. If you would like to learn more about volunteering at Calvary, please contact Arielle Baker.